Day 66. This south cotton gifted by Matu (mashi) had been lying in my wardrobe for some time. I have worn it a few times before getting it washed. And then it lay there neatly folded, partly because I didn’t wear saris all that regularly and partly because every time I would see the laundry tag I would think ‘oh, it’s just been washed, I will wear it some other time’. Today as I took out the sari and unfolded it, a musty smell wafted out. And with it came tumbling so many memories, so many images. A bit haphazard as memories often are. With each pleat made, the memories seemed to fall into place. 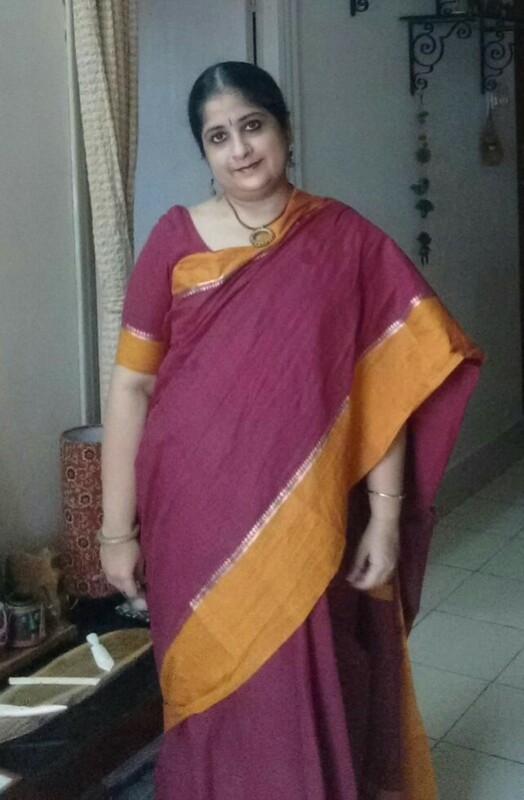 By the time I had tucked in the pleats and smoothened the pallu, an order prevailed in those unruly thoughts. And half the story had been written in my mind. The first image that I have of Matu is a smiling face looking up to a window and asking “kotha diye dhukbo (from where do I come in)?”. No, she wasn’t trying to enter the house through the window (that right is reserved for her son, my Totodada, who had entered his room through the balcony after a late-night party to avoid our Dimma’s ire). This was in Hyderabad, where we lived then and Matu had come to visit us. The flats in the building we lived in were built at split levels so that the window in our dining room looked upon a terrace one level below. We knew Matu was to come but didn’t know she would arrive a day early. So there she was. She had managed to find the house alright and had climbed up the steps and spotted me by the window. That was a favourite seat and I was perhaps reading a book when I heard her voice and looked up to see her smiling face. A happy surprise. A few years later, it was our turn to come to Calcutta on a holiday. She was stitching a red pullover for me and planned to finish it before we left. But as days passed in fun and joy, it became increasingly clear that she had taken on an impossible task. And then I woke up one morning to find Matu and everyone else (Ma, Mamu, Dimma and Mami) sitting in the balcony drinking tea and chatting. The only new addition to the familiar morning ritual was that all the women were knitting. No, they hadn’t all decided to knit me a sweater each, Matu had distributed the work so that the sweater was ready in time. So someone had one hand, another the other and someone else had the front. All knitting furiously. Needles going clickety-clack amid the laughter and the banter. The sweater was made and I wore it for many years before handing it down to my little sister. Another city, another memory. Buying essentials for the start of my hostel life, staying with her on weekends, when she made sure to have my favourite fish ready or ensured that my bed linen was washed and ironed in time for my next visit, celebrating my birthday, buying me new clothes for Puja or taking me out to lunch at a Chinese restaurant near my college when I couldn’t spare the weekend before my exams. And when I fell ill in between exams, she took me home and stayed awake till I fell asleep. I first learnt to make lau chingri (bottle gourd with shrimps) from her and I still make it and phulkopir torkari (cauliflower curry) her way. And every time, I have made either of these, there has only been praise. Not the least because it’s seasoned with her best wishes and love. My one and only Matu. This name for mashi runs in my mother’s side of the family. I don’t know who coined it but I have never heard it in any other family. My mother and all her siblings and cousins call their mashis Matu, sometimes preceded by their name or some other word of endearment or a word to define their place in the age hierarchy (boro, chhoto etc). But me, I only call her Matu. All the rest, with due apologies, are Mashi. Matu is not only one of the most beautiful women I know but also has a beautiful heart. I have only one complaint, yes I do. Wish we saw you more often. Matu, come to Calcutta soon. Please….